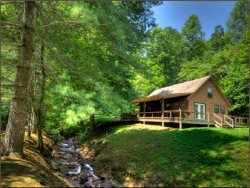 Affordable Two Bedroom Log Cabin Rental near Bryson City and Cherokee, NC. Alarka Hideaway is the affordable, secluded getaway you are looking for. This two bedroom, one bath cabin is perfect for families, friends, or couples to come explore the Smoky Mountains - or simply enjoy them right from the comfort of your cabin. Four wheel or all wheel drive suggested for this property it has a steep gravel drive. When arriving at Alarka Hideaway, you will feel instantly at ease when you take in the beauty of the Smoky Mountains right from your cabin's steps. There is a fenced in flat yard perfect for kids to play or your furry friends to enjoy. The fire pit and hot tub are perfect for enjoying a nice quiet evening outside while enjoying the sounds of nature. Inside, you will find the cabin has a nice, open floor plan and many amenities such as flatscreen television with Direct TV, fully equipped kitchen, and pool table. Both bedrooms are equipped with queen-sized beds and the bath has a tub/shower combo. Alarka Hideaway is located about five minutes from downtown Bryson City, home of the Great Smoky Mountain Railroad. You're close enough to enjoy town's amenities such as delicious dining options, boutique shops, and the Deep Creek Community, where you and your family can hike, see waterfalls, tube, swim, fly fish, or simply have a nice picnic. It is also located about fifteen minutes from the Cherokee Indian Reservation, Harrah's Cherokee Casino, and the entrance to The Great Smoky Mountain National Park. If heart pumping adventure is what you're looking for, the Nantahala River Gorge is located just 15 minutes away where you will find many opportunities for whitewater rafting, kayaking, ziplining, and horseback riding. Two bedrooms, one bath - 2 queen sized beds, sleeps 4. Cabin is equipped with kitchen, flatscreen tv with Direct TV, pool table, hot tub, fire pit, charcoal grill. I have stayed multiple times in the past 15 years on one of the properties and have been handled perfectly when I had questions and when reserving. The team is knowledgeable and efficient. The Alarka Hideway was a nice size cabin. A little more on the modernized side (a/c and heat, fence in yard) which is great for those that are on the fence in staying in a cabin away from modern technology. It was a very good experience staying at he alarka hideout everything was perfect.. we will be coming again.. awesome experience. My boyfriend and I had a wonderful time. We enjoyed the cabin, definitely exceeded our expectations. Everything was clean and peaceful. I booked our cabin and when trying to put a discount into the discount area in checkout it did not go through. I called the phone number provided and they gave me the discounted rate! Very friendly service. The property was perfect for us and our dog. She loved to be able to run around in the backyard in the evenings! Very nice furniture and amenities. You were very kind. It was our 44 Anniversary. And yes I waited until the last week to make reservations. I have a lot of medical problems, and cannot plans things ahead. I didn't think you had anything open, but you did. THANKS WE ENJOYED IT. We didn't do anything but lay around. We ENJOYED the Jetted tub. We didn't get in hot tub. Wish we could have been able to bring the cabin back with us. It was really nice. Thank you. Will plan on staying again. The cabin exceeded my expectations! The staff was extremely polite and respectful. It was a pleasure speaking with them. The cabin was great. It is in a secluded area but not too far away from ingles to where it is a hassle to get groceries. The cabin warms up quickly and the hot tub is great! Loved the seclusion and hot tub. Cabin was warm & comfortable.